Global, national and local policies and programs for agricultural development are recurrently justified based on their alleged role in improving food security, diet quality and nutritional status. However, strikingly little evidence is available to prove that a direct, household-level link between agricultural production and improved nutrition exists. In the December 2015 Ag2Nut call, the Community of Practice presented a synthesis of a set of eight new studies that empirically test, using data from Africa and South Asia, whether a relationship between household agricultural production, diets and nutrition can be found. The studies came out as a Special Issue of the Journal of Development Studies (edited by Gero Carletto, Marie Ruel, Paul Winters and Alberto Zezza; vol. 51, Issue 8, August 2015). Overall, the data and studies in the volume support the hypothesis that household agricultural production has direct and important linkages with dietary patterns and nutrition. Alberto Zezza (World Bank) presented a synthesis of the volume, followed by presentation of two of the volume’s studies. Neha Kumar (IFPRI) presented “If they grow it, will they eat and grow? Evidence from Zambia on Agricultural Diversity and Child Undernutrition” (co-authored with Jody Harris and Rahul Rawat). 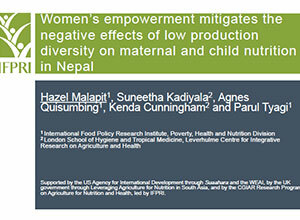 Hazel Malapit presented “Women’s empowerment mitigates the negative effects of low production diversity on maternal and child nutrition in Nepal” (co-authored with Suneetha Kadiyala, Agnes R. Quisumbing, Kenda Cunningham & Parul Tyagi).